I was given a copy of the new You Need A Budget (YNAB) book in exchange for my honest review. I was excited to receive a copy of the book since I was already on my library’s waitlist for it. Hey, I’m a frugal gal and didn’t want to pay for it! I’ve written before about why I love the YNAB budget software, but YNAB is both software AND a philosophy. This book is written by YNAB’s founder, Jesse Mechan. 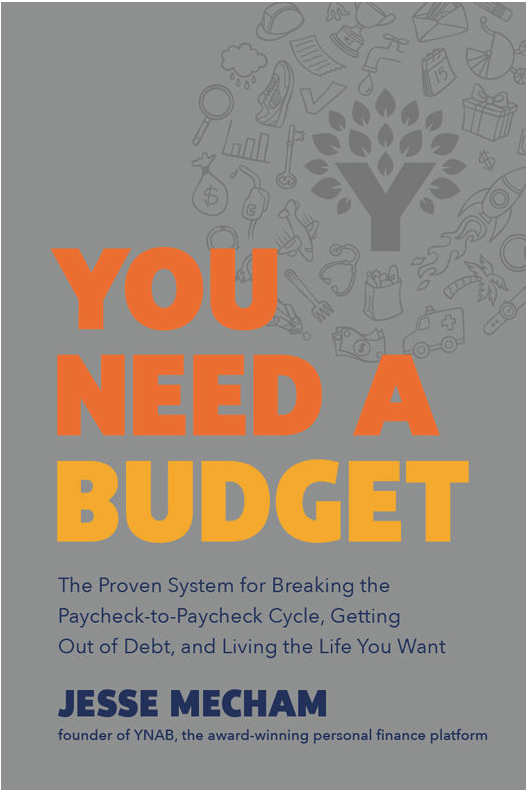 The full name of the book is You Need a Budget: The Proven System for Breaking the Paycheck-to-Paycheck Cycle, Getting Out of Debt, and Living the Life You Want. Give every dollar a job – Make a zero-based budget, assigning every dollar to a category or goal. Embrace your true expenses – Make sinking fund categories for things that are not monthly like 6-month car insurance or irregular expenses like medical bills or home repairs. Roll with the punches – Change your budget when needed as life happens and priorities shift. Age your money – Break the paycheck to paycheck cycle by saving up a buffer so you’re not timing paychecks to bills. The other half of the book discusses budget topics like finding your priorities, working together with a partner, and teaching children about money. Personally, I really enjoyed the second half of the book more because I’m already very familiar with YNAB’s four rules. Is the YNAB Book Useful for Someone Who Already Uses YNAB? This was my biggest question before I read the book. I think if you use the YNAB software, but haven’t read much about their philosophy, you’ll get a lot out of the book. If, on the other hand, you’re a big YNAB fan who follows their blog, podcast, and Youtube videos, you’re going to feel like the majority of the book is things you’ve already heard. It might be worth reading as a good refresher, but it’s going to feel like mostly old news. I personally fall into the “big fan” category. While I’m glad I read the book, I don’t think it would have been worth paying full price for it for myself. Is the You Need a Budget Book Just an Ad for YNAB Software? I also wondered if the book would feel like a big advertisement for YNAB. It definitely does not feel like an ad for the software. Actually, the software is barely mentioned in the book. Is the YNAB Book Useful for Someone Who Doesn’t Want to Subscribe to YNAB? Definitely! I think the book is an excellent introduction to the concepts of budgeting and getting a handle on your money. It would be a good read for a young person who is just starting out or someone who is ready to finally get their money under control. It really doesn’t matter which tool you use to implement the ideas. I do believe that the YNAB software is the best tool available, though. If someone didn’t want to spend the money on the YNAB software, they could certainly use the budget concepts with a paper and pencil (and that’s even encouraged in the book). Is YNAB Compatible with Dave Ramsey? Dave Ramsey’s baby steps tell you EXACTLY WHAT TO DO with your money and in what order. YNAB’s philosophy tells you HOW TO MAKE A PLAN AND FOLLOW YOUR PLAN with your money. If you want to make your plan Dave Ramsey’s baby steps – great! If you want to make up your own plan – great! YNAB won’t tell you what your plan should be. That’s totally up to you. I don’t think Dave Ramsey does a very good job of teaching the day-to-day HOW of following through with the baby steps. YNAB does a great job of filling that gap. I’ve heard a rumor that YNAB was started when Jesse was following Dave Ramsey’s baby steps himself. A young person just learning about managing money. Someone who has struggled with money and is ready to finally make a plan. A Dave Ramsey follower who is frustrated with the everyday how-to of following the baby steps. A new user of YNAB who wants to understand the philosophy better. For longterm fans of YNAB, I think the book will be mostly review but could be a fun refresher. I definitely enjoyed reading it. This looks like an excellent resource for someone like me who is struggling to learn better budgeting skills. I look forward to checking it out!